over results presentation. What's Custom Search without customization? Today, we're launching Custom Search Themes, which make customized presentation a blast! You can now select from among a set of slick styles that make the search results look awesome. If you love a style, but need to tweak it, you can customize it further by changing fonts, colors, backgrounds, promotion settings, as well as interactive features such as tabbing and mouseovers. The preview function shows you the effects of your changes instantaneously - WYSIWYG. You can also select from among a set of convenient layouts for full flexibility on the location of the search box and results - contiguous or in 2 columns - you decide! We've even added a compact layout (with only 4 results) that is useful for websites where space is at a premium and search results will not occupy the whole page. Mobile Custom Search, launched last week, uses the compact layout for rendering results on high-end mobile devices e.g., Android phones, the iPhone, iPod touch and Palm Pre. We automatically create a Google-hosted home page for every Custom Search engine, so you can redirect mobile visitors to this page, since we automatically serve up mobile-optimized results. There are several results hosting options. The most flexibility is offered by the Element, which renders results inline on a webpage -- your users can quickly review results, narrow results to specific categories with a simple tabbed interface, and dismiss results, all without leaving your webpage. We believe this will make it easier and faster for your website's users to find the information they are looking for. The Element now renders special structured data, e.g., Thumbnails and Actions, that you can provide via structured markup on the page. With Themes, we're providing great look and feel options for your results out-of-the-box. If you want even more control, you can directly download and manipulate the Cascading Style Sheet (CSS) files that control results styling. You can also refer to the documentation on the AJAX Search API that the Element is built with. Remember - not all customization is pretty, so choose wisely! We'd love to hear your feedback about Custom Search Themes. If you build out a great customized theme that you'd like to share with us and other Custom Search users, we'd love to see it. Besides great results relevance, one of the most popular features of Custom Search is the ability for you to customize the look and feel of the results to match your website. Our users have always requested more control over results presentation. 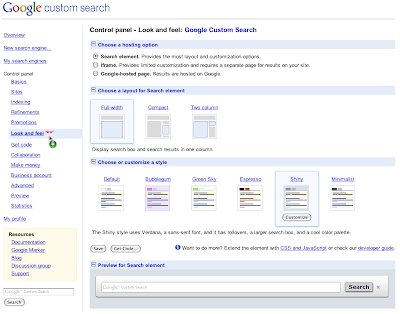 What's Custom Search without customization?